I do realise that I'm probably in danger of sounding like a grumpy old man here, however.... I recently revisited a favourite landmark, not far from home, called Butser Hill. The walks and the amazing views were all still just as good as I remembered. Assuming, the car parking fee would have gone up since, I had made sure to bring plenty of coins. However, on pulling up to the 'Pay as you exit' barrier, I was shocked to discover the new machine only accepted bank cards (which I hadn't bought with me)! To put you more in the picture, this hill is completely isolated from any other facilities - in the middle of the countryside. If, like me, you had assumed that money was an acceptable way to pay for things - you were stuck. Fortunately, the people in the car behind us bailed us out, and used their card to let us out. I do find it audacious that Hampshire County Council see fit to effectively ban anyone who doesn't use a bank card from visiting this public facility, let alone anyone like me who simply thought that cash was still a valid means of exchange - shame on you HCC. Adjusting to the loss of your beloved horse, and keeping a connection. It’s not something we want to think about before it happens, but when your horse succumbs to illness or old age, it can be both traumatic and devastating. The pain of losing your cherished horse can be little different to losing a close family member. The emotional, physical and financial investments you have made into them run deep. The process of grieving unavoidably takes time. The transition from pain and loss to one of treasured memories is a gradual one. One doesn’t so much reach a point where you forget, but the memories transition into a warming and comfortable mode, where you can happily linger. Munnings is reckoned by many to be one of England's finest painters, known not only as an equestrian artist par excellence, but also, as then president of the Royal Academy of Arts, one who famously slated the modernist movement live on radio in his farewell speech, whilst clearly inebriated! An interesting stance in hindsight, as his own style was often as much about the rough, impressionistic brushstrokes as it was the subject. I remain in awe of how so few brushstrokes can convey so much. Equally though, he also took quite a classical approach with composition, with many of his horse portraits having more than a touch of George Stubbs about them - maybe that's why I like his work so much. Starting his working life as an apprentice to a printer in Norwich, designing advertising posters for six years, Munnings then moved on to become a full-time painter. Meeting his first wife Florence Carter-Wood at the Newlyn School of painters, their tragic marriage lasted just two years, when Florence killed herself. Five years later, Munnings purchased Castle House at Dedham, in which he lived and worked for the rest of his life, remarrying in 1920, to another horsewoman, Violet McBride. Despite some notable commissions from high society, and opportunities for more, Munnings became best known for his depictions of horses, in particular those set in hunting and racing scenes. His work remains immensely popular, and ever increasing in value, with 'The Red Prince Mare' reaching a sale price of almost $8m in 2007. Still time to order before Christmas... just. It is still possible to commission a portrait painting of your horse, and have it delivered in time for Christmas. However, please don't delay - there really isn't much time left to book it in. So if you'd like to make an order, or discuss options for a painting, do get in contact either by phone: 023 9241 0108 or email: andrew@finehorseportraits.co.uk as soon as you can. If you're considering a portrait painting of your horse, do you need to use a local artist? I was recently asked if I could paint a portrait of a horse that was stabled some 260 miles away from where I live and work. It can be done of course, but would have made a very long day to visit him for the necessary studies, along with the associated travel costs. So, as an alternative, and with some research, I managed to find an established equestrian photographer who lived not far from the stables, and was able to brief him on all my particular requirements for photographic reference. It all worked out really well - with his experience of horses, the photographer really understood the sort of shots I was looking for, and supplied a great set of images that I was then able to work from, for the painting. This not only made a good saving for my client, but it's great to know that whatever the distance, it need not be an issue. Equally, although ideally I would always prefer to visit the horse or pony in person, if you have a selection of your own photography that you'd like me to work with, I am always happy to appraise them for their suitability as reference for a painting. 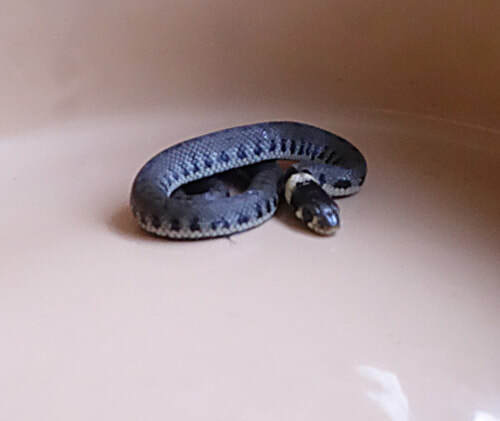 Really cute, but very curious... Just how did this baby grass snake not only get into the house, but then manage to climb into the large dog's bowl? As it was, the dog's were fed a normal dinner, and the snake was safely released into some long grass. 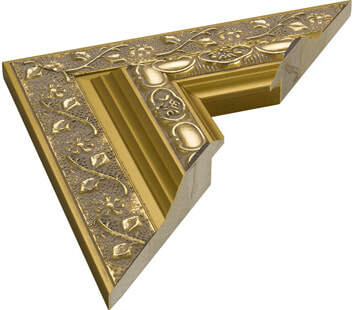 I am pleased to announce that I am now in a position to provide a full framing service to all my clients. My paintings are produced on either stretched canvas or directly on board, and to date, have mostly been supplied without a frame. 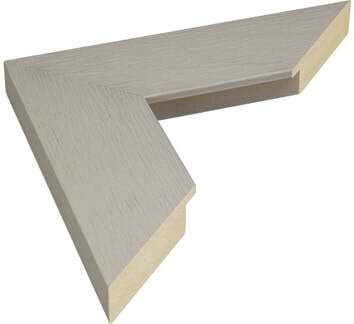 However, I now have a trusted, well-established framing company who are able to provide a wide range of high quality styles. 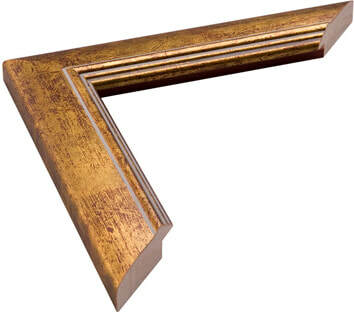 So whatever your taste, or your home decor, we will be able to complete your painting with a frame that fits just right - ready to hang on your wall. If you would like your painting to be framed, we can discuss your specific requirements and preferences, in order to show you a range of frame and mount choices for your consideration. You don't need to know exactly what sort of frame you want before enquiring, nor even until your painting is completed - I am happy to discuss ideas and options. 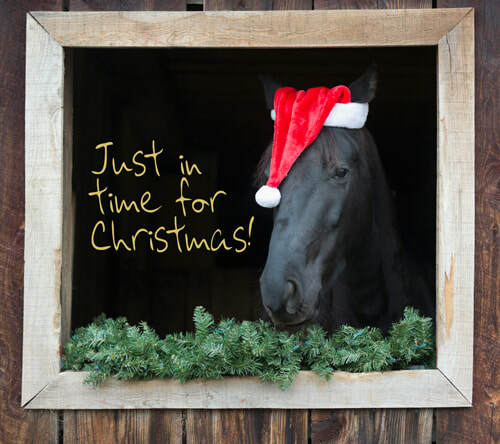 I've recently come across two Equine Assisted Therapy practitioners, one in the Pennines and one in the South Downs. Their stables were similarly hidden away in the quietest of locations. So much so for the South Downs practice, that you can only reach the valley where it's located by going along a seemingly endless and narrow single-track lane (really hoping you don't meet something coming the other way). It is more than worth it though, because when you arrive at the stables and fields, you really do feel like you have this beautiful, little world all to yourself. 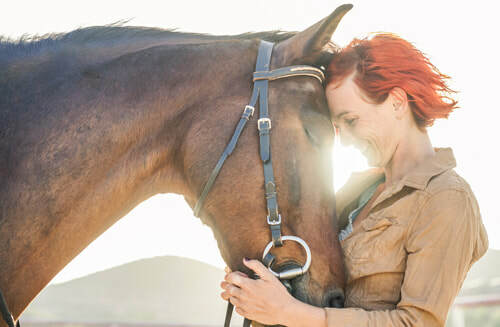 However, regardless of locations, the work that these Horse Therapy practitioners do is so impressive… and, because horses are so amazing at connecting to people, without judgement. Their sensitivity is essential in the wild for survival and it is this that enables a horse to pick up on what we are feeling, then reflect it through their body language back to us. This powerful mirror of ourselves displayed in the horse, enables individuals to learn about their own emotions and behavioural patterns. Through trying different approaches to get the horse to accept them in unity, people can discover ways to make positive and lasting changes. This in turn positively impacts their relationships with other people, and helps them to lead happier and more fulfilled lives. Wow! Not one albino deer, but two. Walking my dogs along the edge of a long wooded slope, just near the cottage the other day, I saw a small herd of 10-12 roe deer, resting not all far from me in amongst the trees, and remarkably, they hadn't spotted either myself or the dogs (who amazingly behaved themselves). There were 6 stags and several does - one of which was completely white, even the the usual stripey rump was all white. And a 2nd doe, not white like the first, but a very pale version of the normal roe deer colouring. Now standing quite still, I was able to watch them for several minutes before I tried to move in a bit closer - not a good decision, as they then immediately saw me and quickly moved off further into the trees. Why is it you never have a camera available, just when you most need it? Unlike humans, deer have multiple pigments and albinism in animals is considered to be a hereditary condition characterised by the absence of melanin in particular, in the eyes, skin and hair. Whilst a deer with complete absence of melanin is called an albino, a deer with only a diminished amount is described as leucistic or albinoid, so I guess this herd has one of each. I have since seen them another 3 times, but not as close up, and got this more distant photo (above). So the quest is on to get some really clear, close up pics - I shall post an update if I'm successful. Born in the early 1700s, Stubbs began his early work on equine anatomy by severing a horse's jugular vein, suspending it from a ceiling, and then gradually stripped away the various layers of skin and muscles in order to study and illustrate. This was a period in our history when horses were generally considered 'beasts', to be used and abused without consideration of their welfare. With veterinary science being largely non-existent, equine welfare was left to farriers, and written advice by the likes of Gervase Markham, who recommended such practices as rubbing a horse's coat with its own blood to make it glossy, and for unresponsive horses, he advised to create sensitive spots on it's sides by perforating and lifting the skin, rubbing in salt! There were signs of progress too in the eighteenth century, with men such as William Gibson and Henry Bracken writing to denounce the ignorance and abuse promoted by Markham. It was not however, until the very end of the century before the first veterinary college was established. It is good to reflect on, and be most grateful for, just how far we have progressed to the present day. Did you see the wild Dartmoor ponies on Hugh's Wild West series, on Sunday evening (11/3/18)? If not, it's worth going on to iPlayer to catch up. As an article at the end of his program, they showed some really lovely filming of the ponies running free across the moorland. Having lived on the moors for at least three and a half thousand years, and in recent centuries been used in the granite industry, they are now no longer needed as working animals, and accordingly, their numbers have dropped drastically - from around 30,000 pure bred ponies in the 1950s to around 1,500 today.